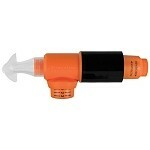 While other breathing device manufacturers produce one-size-fits-all products, we offer devices for specific purposes. Since no two people are alike, we know no two people breathe alike. An Olympic swimmer doesn’t breathe the same as a person who swims only for fitness. Neither does a singer breathe the same as a triathlete. Each PowerLung® model has its own range of independently adjustable resistance for optimal training and to give you optimal results, whether it is for exercise, competition, or just your general well being. With easy to set controls and simple breathing exercises, you can improve your breathing and fitness in just five minutes. The AireStream is designed for moderately active people who are not involved in athletics or exercise programs, but wish to make healthy lifestyle changes. The AireStream helps you breathe easier and enjoy daily activities. Amateur and professional performing artists can use this model to improve breathing techniques and breath control. The BreatheAir is designed for people who are moderately active, exercise at least two to three days per week, and engage in low intensity activities like walking, fitness swimming, or yoga. Performing artists can use this model to improve breathing techniques for breath control and muscle memory. The Trainer is designed for people looking to improve performance in sports and other rigorous activities. Advanced or professional performing artists specializing in high pressure instruments, or professional singers with high lung volume, can use this model to improve endurance and breath control. The Sport is designed for people involved in strenuous, competitive training activities. Elite athletes can use this model for maximum resistance training. This model does not adjust lower to include the resistance of any other models.